Home > News > Industry News > Spring, Multi-cylinder, and Single-cylinder, 3 Types of Cone Crusher, do you choose the Right One? 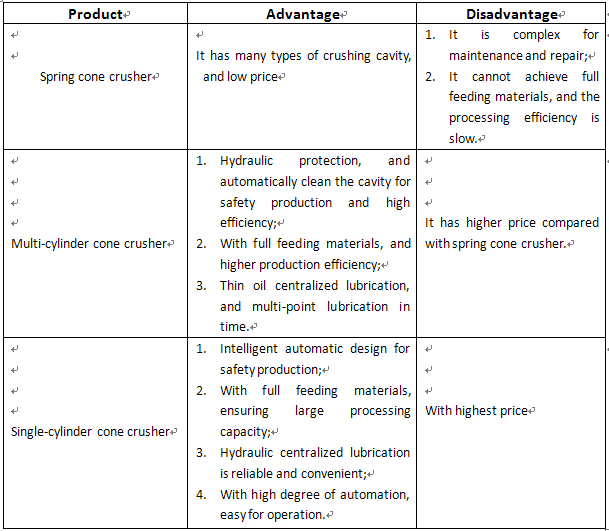 Spring, Multi-cylinder, and Single-cylinder, 3 Types of Cone Crusher, do you choose the Right One? Cone crusher is widely applied in the mining crushing, metallurgical industry, chemical industry, construction industry, construction waste recycling, and cements industry, etc. It has good performance, high crushing efficiency and low use-cost. At present, the main cone crusher in the market is spring cone crusher, multi-cylinder cone crusher and single-cylinder cone crusher. Different types of crusher has different features, the customer should choose the right one according to their actual situation. Next Article: How Fineness the Limestone can get processed by Ore Grinding Machine?